Shropshire Council is suffering a perfect squeeze. Costs are soaring. Government cuts are hurting. And the council is not raising enough money. The council is short of money because the government has cut grants to local authorities, taking £44m from Shropshire alone. Shropshire Council leaders refused to increase council tax for six years. That political dogma has left the county short of £15m a year, money we desperately need. As income fell, the cost of providing adult social care in Shropshire shot up by 50%. That’s an extra £46m the council is struggling to find. The result is significant planned cuts to many important and valued services. The latest round of cuts is expected to total £19m. This is my 1000th blog post on andybodders.co.uk. I am sorry that it is on such a depressing subject. Shropshire Council has cut £48 million from its budget over the last three years under pressure of government cuts. It will need to cut, or in its words “save”, £18.5m next year. The council has now set out details of the proposed cuts and is asking for public comments. This article looks at the council’s main sources of income and why there is a need for cuts. Income is funding from specific grants, charges (including for care) and fines. Net budget requirement is the money that the council needs to find from council tax, business rates and central government funding. 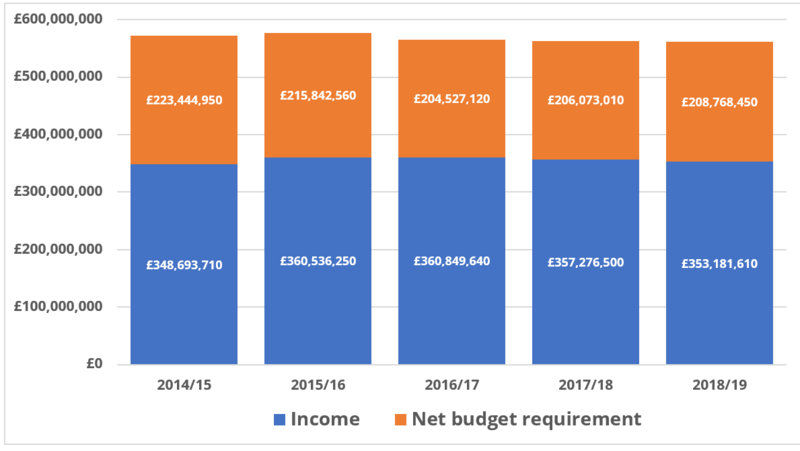 At first glance, the overall budget position for Shropshire Council might not look that bad. The annual cash pile gone down by around £10m, less than 2%, over the last five years. But this has been a period during which the cost of adult social care has rocketed. Inflation and long overdue increases in staff pay have also had an impact. 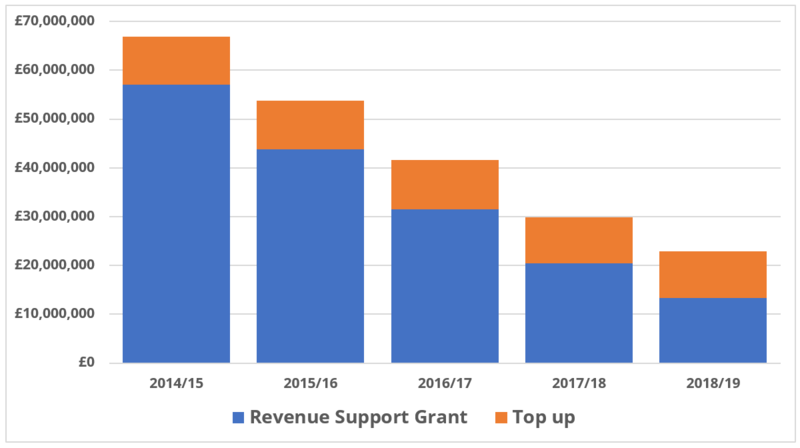 In 2013/14, Shropshire Council received £67m from the Ministry of Housing, Communities and Local Government through revenue support and top up grants. Fast forward five years to 2018/19 and government support has been cut two-thirds to £23m. Past political decisions have not helped Shropshire Council’s finances. For five years, the government offered councils money if they didn’t raise their council tax charge. It was a King’s Shilling and Shropshire Council took it. 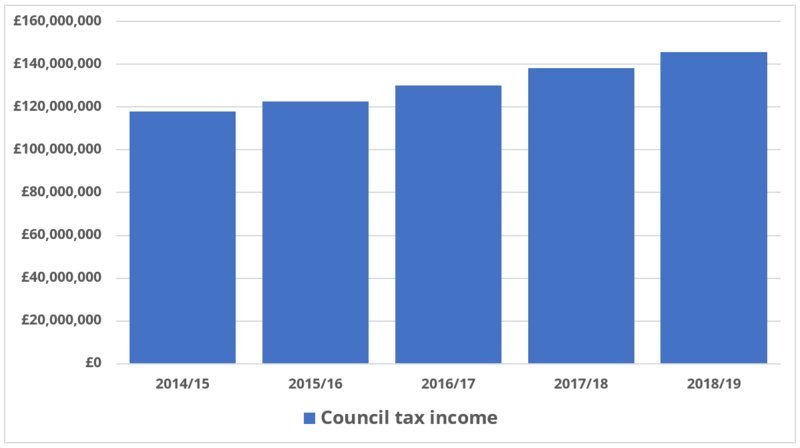 Council leaders boasted that council tax was not rising but seemed not to grasp that they were undermining the council’s long-term financial viability. The political dogma of no council tax rises has cut the council’s income by around £15m a year. Council leaders are now desperately playing catch up by pushing council tax rises to the maximum allowed without holding a referendum. Currently the limit for an increase in Shropshire is 3.99%. That’s how much our council tax will go up in April unless councillors vote down the rise. Although the debate on council tax last February was rather heated, I would be surprised if this year’s rise was vetoed. Shropshire Council receives half of the business rates raised in the county. This contribution to the budget has have risen very little, from £38.3m to £40.3m over five years. The council’s income has been lagging behind the level of need. Adult social care is the main challenge facing the council. Costs have risen from £90m to £137m over five years. This is a statutory responsibility and cannot be ducked. This is the “perfect squeeze”. Adult social care costs soaring while income remains static, even falls. Shropshire Council is not a Northamptonshire basket case. But it must make cruel cuts to balance the books. We would barely have to make any cuts at all next April if the council had managed its finances properly and increased council tax every year. I’ll look at the proposed cuts in articles later in the week. Andy, I realise that money must be raised somewhere but as someone not on benefits but already paying 12% of my monthly income as council tax ( even taking into consideration the single person’s allowance) you will appreciate that another rise would be a major blow. Last year the monthly amount was increased substantially and not all of us are well heeled pensioners. How about campaigning for a differential council tax where those on the largest incomes pay proportionately more than those on the lowest incomes. It is very unfair at the moment. This is a very important point Wanda. Council tax is reccessive and hits the poorest, also those with limited incomes that live in larger homes. A local income tax might be fairer but could be complex to introduce. Until this year, Shropshire Council gave many people on benefits a 20% discount on council tax. But Conservative councillors axed that declaring that everyone should share the burden of budget cuts. I retorted that the poor should never share the burden.